We reserve the right to cancel the event if there are not sufficient registrants by SEPT. 15, 2017. Complete Level 1 of Handbell Musician Certification in Handbell Techniques, Music Theory and Conducting in Area 2! We will also be offering Accreditation for faculty to teach Level 1 Certification courses in Handbell Techniques and Music Theory. Each Accreditation class is limited to 4 faculty candidates. Accreditation application details are available here. 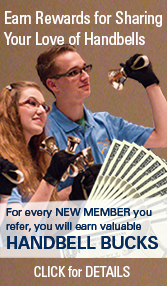 The Handbell Musician Certification program is a comprehensive curriculum designed to provide training and experience at all levels to handbell musicians. 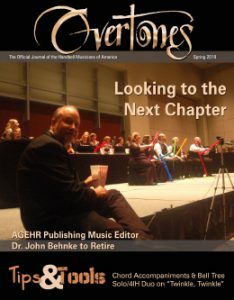 The study areas are Music Theory, Handbell Techniques, Conducting, Arranging and Composing, Handbell History (available on-line now!) & electives. Click here to see more information about the program. Register now at the link below. Members, be sure to log in to your member account before you follow the link. Not already a member? Join here. Please note that to participate in the Accreditation Class, students must first complete an application for acceptance to the course. A $50 non-refundable application fee is also required. This fee will be applied to your registration fee if you are accepted for training. Applications must be completed and received by Sept. 1, 2017. You will be notified of your status by Sept. 15, 2017. The process includes a comprehensive written application, a video presentation and recommendations from three references that have observed the applicant teaching within the past two years. See complete details of the process to apply for Accreditation here. There will be a $50 cancellation penalty for any cancellations received by September 15, 2017. After that date, no refunds will be given for any reason. A cancellation will be considered confirmed when written notice is received by the event registrar, Vickie Iverson at viverson@handbellmusicians.org. You are responsible for making your own lodging and transportation arrangements. Registrants will be able to contact each other to look for roommates and share transportation. The Temperance House is within walking distance of the site, and Homewood Suites and Hampton Inn are within a 10-minute drive of the church. We have arranged for a rate of $129/night, which includes breakfast and wifi, at the Hampton Inn & Suites Newtown. Rooms will be available at this rate through September 22, 2017. You can make your reservation using this link: http://hamptoninn.hilton.com/en/hp/groups/personalized/A/AVPNTHX-HMA-20171012/index.jhtml. You can also call the inn directly at 215-860-1700 or national reservations at 1 (800) 426-7866. In either case, ask for the Handbell Musicians of America rate. All meals are at your own expense, although we will make arrangements to have lunch brought on site on Friday if you wish.